Free unlimited ridership is available on CDTA buses for all registered and paid students taking college credit courses for the fall and spring semesters, as well as intersession and summer terms. Students can use their student ID as a bus pass to access all CDTA routes including the STAR service and the Northway Xpress commuter service. The free ridership service is activated when students pay their bill. There may be up to a two-day period for a student’s ID card to be activated. Free CDTA ridership ends on the last day of the fall semester. Students who register and pay for either intersession classes or the spring semester may use the CDTA service during intersession. The free ridership service ends on Commencement day for spring semester students. Students who register and pay for summer courses may use the CDTA service during the part-of-term for which they are enrolled. Every weekday, 100 CDTA buses stop on campus providing hundreds of students and staff members with viable transportation to campus. The college hopes students will take full advantage of this energy-saving and money-saving opportunity. 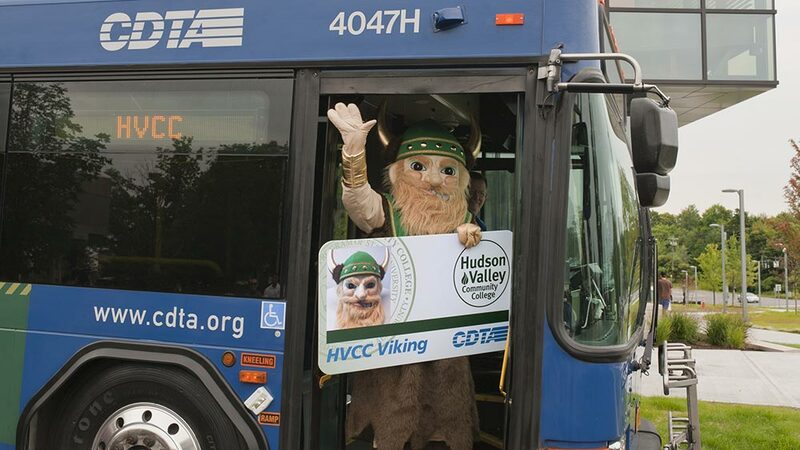 Nine out of ten Hudson Valley students live within the area serviced by CDTA and 42 percent have access to direct CDTA service. The college is served directly by Routes 224 and 85 several times a day. For all other connection routes visit www.CDTA.org or call (518) 482-8822. CDTA's website includes real time information for all routes, a trip planner and free mobile applications to help students track their preferred schedule and route. Questions about access to the program? Contact Carol at (518) 629-7518 or Mary at (518) 629-7549 in the Faculty Student Association Office.